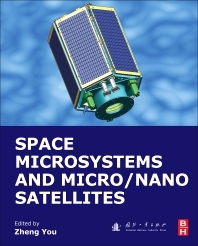 Space Microsystems and Micro/Nano Satellites covers the various reasoning and diverse applications of small satellites in both technical and regulatory aspects, also exploring the technical and operational innovations that are being introduced in the field. The Space Microsystem developed by the author is systematically introduced in this book, providing information on such topics as MEMS micro-magnetometers, MIMUs (Micro-inertia-measurement unit), micro-sun sensors, micro-star sensors, micro-propellers, micro-relays, etc. Summarizing the scientific research experiences of the author and his team, this book holds a high scientific reference value as it gives readers comprehensive and thorough introductions to the micro/nano satellite and space applications of MEMS technology. Prof. Zheng You graduated from Huazhong University of Science and Technology and obtained his PhD degree in 1990. He is currently a Professor at the Department of Precision Instrument in Tsinghua University, and an active member of Chinese Academy of Engineering. His research interests focuses on Micro/nano technology and Micro/nano satellites and has published more than 300 peer-reviewed papers. Prof. You is also the Vice chairman and secretary-general of Chinese Society of Micro-Nano Technology, and the Vice Chairman of China Instrument and Control Society.